On November 10, 1983, at the Plaza Hotel in New York City, happened a modest event, which will have a very important impact on the software industry in the next decades—the little known company Microsoft Corporation formally announced a graphical user interface (GUI) for its own operating system (MS-DOS), which had shipped for IBM PC and compatible computers since 1981. Initially the new product was developed under the name Interface Manager, but before the official introducing in 1985, the marketing gurus convinced Bill Gates, that Windows is a more suitable name. The main partner of Microsoft since 1981 was IBM, when MS-DOS became the highly successful operating system, that came bundled with an IBM computer. That's why in that same November of 1983, the owner of Microsoft Bill Gates decided to show a beta version of Windows to IBM's management. Their response was negative though, probably because IBM was working on their own operating system, called Top View. IBM Top View was released in February of 1985 as a DOS-based multitasking program manager without any GUI features. IBM promised that future versions of Top View would have a GUI. That promise was never kept, and the program was discontinued barely two years later. It seems Bill Gates realized how profitable a successful GUI for IBM computers would be, while he had seen Apple's Lisa computer and later the more successful Macintosh computer. Both Apple computers came with a stunning graphical user interface. Microsoft needed more than 2 years to launch the announced product—Microsoft Windows 1.0 (see the upper image), which was introduced in November 20, 1985, and was initially sold for $100. MS Windows version 1.0 was considered buggy, crude, and slow. Its rough start was made worse by a threatened lawsuit from Apple Co. 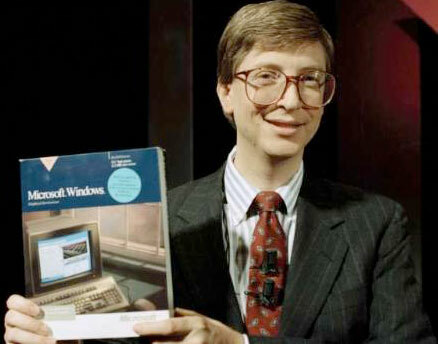 In September 1985, Apple lawyers warned Bill Gates that Windows infringed on Apple copyrights and patents, and that his corporation had stolen Apple's trade secrets. 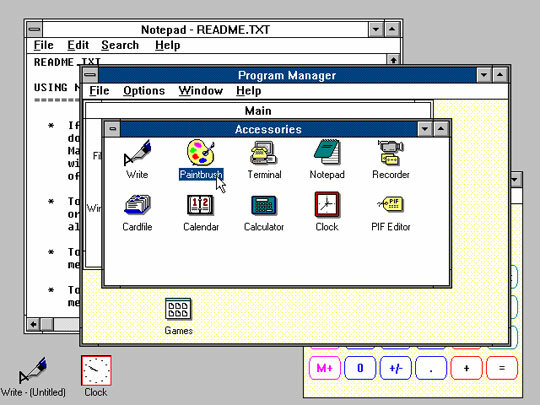 Windows had similar drop-down menus, tiled windows and mouse support as Apple's operating system. Gates decided to make an offer to license features of Apple's OS. Apple agreed and a contract was drawn up. A couple of years later though Bill Gates will have again copyrights infringement problems with Apple (Apple vs. Microsoft & Hewlett-Packard copyright suit), and then he decided to claim that Apple had taken ideas from the graphical user interface developed by Xerox for Alto and Star computers. Microsoft Windows 2.0 was released in December of 1987 and was initially sold for $100 also. It was a much-improved Windows, that made Windows-based computers look more like a Macintosh, introducing icons to represent programs and files, improved support for expanded-memory hardware and windows, that could overlap. 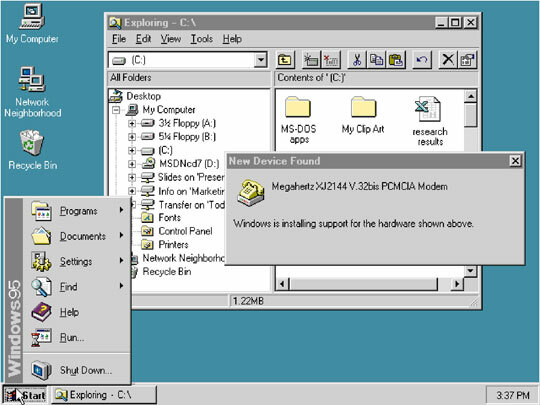 In May, 1990, the initially critically accepted Windows 3.0 was released (see the upper screenshot), full version was priced at $149.95 and the upgrade version—at $79.95. Windows 3.0 had an improved program manager and icon system, a new file manager, support for sixteen colors, and improved speed and reliability, and most important–Windows 3.0 gained widespread third-party support. Programmers started writing Windows-compatible software, giving end users a reason to buy Windows 3.0. Three million copies were sold the first year, and Windows finally came of age. In April, 1992, Windows 3.1 was released and became a smash hit, selling almost 3 million copies within the first two months of its release. It featured the new TrueType scalable font support, along with multimedia capability, object linking and embedding (OLE), application reboot capability, and more. Windows 3.x became the number one operating system installed in PCs until 1997, when Windows 95 took over. In July 1993 was introduced the first version of a family of Microsoft operating systems—Windows NT 3.1 (The version number was chosen to match the one of Windows 3.1, the then-latest operating environment from Microsoft, on account of the similar visual appearance of the user interface). Windows NT 3.1 was the first version of Windows to utilize 32-bit "flat" virtual memory addressing on 32-bit processors. Its companion product, Windows 3.1, used segmented addressing and switches from 16-bit to 32-bit addressing in pages. Windows NT was originally designed to be a powerful high-level-language-based, processor-independent, multiprocessing, multiuser operating system with features comparable to Unix. It was intended to complement consumer versions of Windows that were based on MS-DOS. NT was the first fully 32-bit version of Windows, whereas its consumer-oriented counterparts, Windows 3.1x and Windows 9x, were 16-bit/32-bit hybrids. Windows 2000, Windows XP, Windows Server 2003, Windows Vista, Windows Home Server, Windows Server 2008 and Windows 7 are based on Windows NT, although they are not branded as Windows NT. On August 24, 1995, Microsoft Windows 95 (see the lower screenshot) was released in a buying fever so great that even consumers without home computers bought copies of the program. More than 1 Million copies were within 4 days. Windows 95 (code-named Chicago) was considered to be very user-friendly. It included an integrated TCP/IP stack, dial-up networking, and long filename support. It was also the first version of Windows, that did not require MS-DOS to be installed beforehand (but was still based on the MS-DOS kernel). In June, 1998, Microsoft released Windows 98. 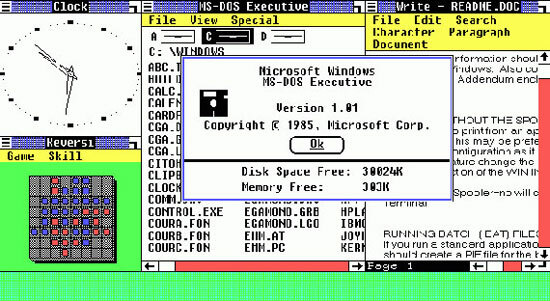 It was the last version of Windows based on the MS-DOS kernel. Windows 98 has Microsoft's Internet browser "Internet Explorer 4" built in and supported new input devices like USB. Windows 2000 was released in February, 2000, and was based on Microsoft's NT technology. Microsoft now offered automatic software updates over the Internet for Windows starting with Windows 2000. 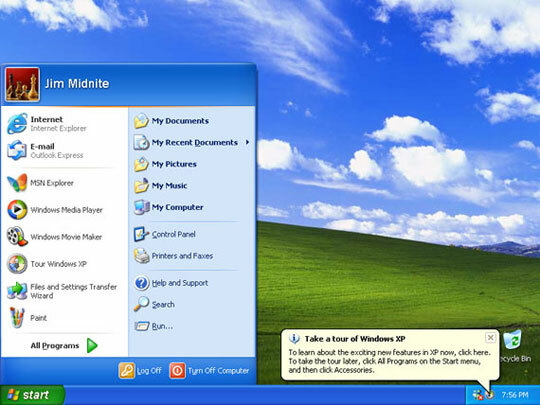 Windows XP (see the lower screenshot) was released in October 2001 and offered better multi-media support and increased performance. 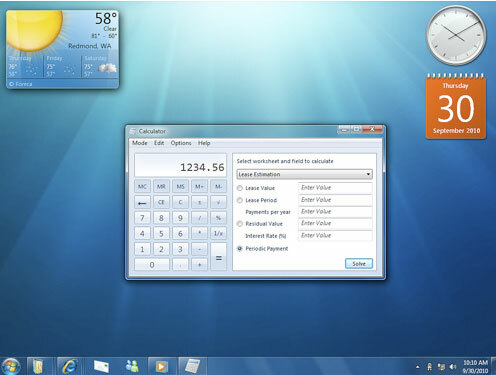 According to Microsoft, "the XP in Windows XP stands for experience, symbolizing the innovative experiences that Windows can offer to personal computer users." The next desktop OS of Microsoft was released more than five years after the introduction of its predecessor, the longest time span between successive releases of Windows desktop operating systems. Windows Vista (known by its code name "Longhorn") was released in January, 2007. It contains many changes and new features, including an updated graphical user interface and visual style dubbed Aero, a redesigned search function, multimedia tools including Windows DVD Maker, and redesigned networking, audio, print, and display sub-systems. Vista aims to increase the level of communication between machines on a home network, using peer-to-peer technology to simplify sharing files and media between computers and devices. Windows Vista includes version 3.0 of the .NET Framework, allowing software developers to write applications without traditional Windows APIs. Microsoft releases Windows 7 in October, 2009. Windows 7 seemed to be the best-selling Microsoft operating system in the history, with 15 million copies sold during the first 9 months. Unlike its predecessor, which introduced a large number of new features, Windows 7 was intended to be a more focused, incremental upgrade to the Windows line, with the goal of being compatible with applications and hardware with which Windows Vista is already compatible. It is focused on multi-touch support, a redesigned Windows Shell with a new taskbar, referred to as the Superbar, a home networking system called HomeGroup, and performance improvements. Some standard applications that have been included with prior releases of Microsoft Windows, including Windows Calendar, Windows Mail, Windows Movie Maker, and Windows Photo Gallery, are not included in Windows 7, most are instead offered separately at no charge as part of the Windows Live Essentials suite. 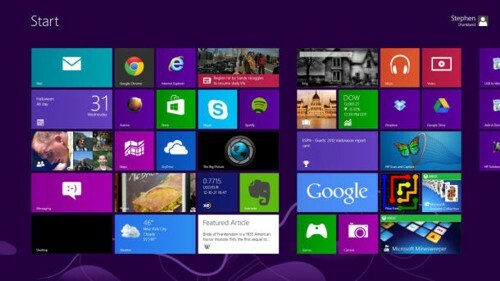 In October 2012, Microsoft launched its latest desktop operating system, called (surprise!) Windows 8. It is the first Micsrosoft's OS, which will be used on tablets and smart phones also. So, what was changed? The desktop was changed radically, as now it is relegated to the side-lines to make way for the new so-called Modern UI (User Interface). There is no more Start button, as this interface is designed to be used with touchscreens as well as with a mouse and keyboard, and requires programs to be written specially for it. These programs will be downloaded via the new Windows Store, or from developers' websites (one can still run programs written for older versions of Windows, but this is possible only on PCs). Microsoft claims also, that Win 8 is sleek, fast and fun (on the right hardware:-), has huge security improvements, better battery life, faster boot, etc. Win 8 features the new "Hybrid Boot" mode (which hibernates the Windows kernel on shutdown to speed up the next bootup). Task Manager has also been redesigned, including a new processes tab with the option to display fewer or more details of running applications and background processes, a heat map using different colors indicating the level of resource usage, etc. And most important improvement—the sinister BSOD (Blue Screen of Death), the nightmare of generations poor users, has been updated with a simpler and modern design with less technical information displayed. Rejoice, O People!